Air-filtering system used to remove particles and fungi from the air. Type of dendritic cell in the skin and mucous membranes that transports antigens to the lymph nodes. A lighted tube that is inserted into the abdomen to examine the abdominal wall. The procedure is called Laparoscopy. (See also peritoneoscope/peritoneoscopy). Procedure involving the insertion of a thin, lighted tube (called a laparoscope) into the abdominal wall to inspect the inside of the abdomen. The removal of the larynx. A last Will and Testament is a statement of what a person wants done with their estate after they die. It is always a good thing for even the healthiest of people to maintain a current and updated Will. It is even more important that a person with a serious illness should do so. Time between exposure and development of symptoms. Example: The latency period for developing mesothelioma can be 25-30 30 years after asbestos exposure. Washing out an organ or cavity, to obtain a sample for diagnosis. Legal action by one person or entity against another person or entity. Dose of a chemical that results in death in 50% of the target population. A lump that may be caused by injury or disease, such as cancer. Cancer of the blood. White blood cells can be produced in excessive amounts and are unable to work properly. The immune system�s white blood cell such as monocyte, and CD4 cell. Various types of leukocytes are involved in the body�s defense against infection and disease. Low number of white blood cells in the circulating blood. The formation of white patches on the tongue or cheek. These are often pre-malignant. Stands for Leuteinizing Hormone-Releasing Hormone, it is a man-made hormone that blocks the male hormone testosterone; sometimes used as a treatment for prostate cancer. Molecule that binds to a specific receptor. Lower boundary of an assay, a viral load test. The limit of detection is the level below which a test cannot measure the presence of a component such as HIV RNA. Machine that is used in radiation therapy to treat cancer. It gives off gamma rays and electron beams. Spherical particle of fat in a liquid. Liposomes may be used to carry drugs or other substances to cells or tissues. Metallic element used to treat mania or bipolar affective disorder or manic-depression. A Living Will is a declaration that a person desires to forego heroic measures and artificial means of life support if there is not a reasonable expectation of meaningful recovery. A Living Will generally states that they would prefer not to have extraordinary medical treatment or artificial nutrition or hydration used to keep them alive if there is no reasonable hope of recovery. A Living Will generally states that they would prefer not to have administered such extraordinary medical treatment or artificial nutrition and hydration and gives the doctor permission to withhold or withdraw life support systems under certain conditions. If a person is unable to make these decisions for themselves, a Living Will can state who will make those decisions. Intrapleural administration is made to exceed the usefulness of other platinum drugs like Cisplatin that are limited by toxicity and drug resistance. A drug that causes loss of feeling or pain. During an operation, the patient is usually asleep. Treated cancer that comes back where it originally was; with mesothelioma, a local recurrence occurs in the pleura most frequently after surgery for the tumor. Cancer that does not spread to other parts of the body. 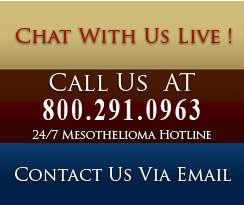 Mesothelioma that hasn�t spread to other organs of the body. Quantities in factors of 10. A log change is an exponential or 10-fold increase or decrease. Heated wire loop to remove a cone-shaped wedge from the bottom of the uterine cervix for biopsy. Cavity or channel in a tubular organ, such as a blood vessel. A mass in the body. A pair of breathing organs located within the chest which remove carbon dioxide from and bring oxygen to the blood. There is a right and left lung. Small oval bodies throughout the body that contains lymphatic tissue that is surrounded by a capsule of connective tissue. They act as a first line of defense against infections and cancer. Lymph nodes filter lymph fluid, and they store lymphocytes which are white blood cells. They are located along lymphatic vessels. Also called lymph gland. The involvement of lymph glands by mesothelioma changes the stage to a higher one and is an indication of a more advanced tumor. Almost colorless fluid that travels through vessels called lymphocytes in the lymphatic system and carries cells that help fight infection and disease. A test that looks at the lymph nodes. Tissues and organs that produce and store lymphocytes and the channels that carry the lymph fluid. The entire lymphatic system is an important part of the body's immune system. Invasive cancers sometimes come into the lymphatic vessels and spread to lymph nodes. Tubes that connect lymph nodes and allow flow of lymph. Swelling from obstructed cancerous lymph nodes or from removed lymph nodes. The increase in the number of lymphocytes in the blood, usually happens with chronic infections or inflammation. White blood cells that kill viruses or bacteria, and defend against the invasion of foreign material. Chemical messenger produced by lymphocytes that controls immune responses by stimulating macrophages, killer cells and other lymphocytes. A cancer of the lymphatic system. Doctors differentiate the different lymphomas by the type of cell that is involved in the makeup of the tumor. Treatments depend on the type of cell that is seen. Minute organelle within a cell that contains the lytic enzymes the chemicals that break open the cell wall.